Is there no better feeling in the world then strutting around an airport knowing that your first class upgrade cleared over a week ago and that you’re going to be stretching out like a king in a big comfy seat for the final leg home? Well, duh, of course there is. But that didn’t stop me from feeling like the #1 luckiest dude in all of SeaTac as the minutes ticked down to flight time. I didn’t mention it before, but I made Alaska Airlines MVP status by the skin of my teeth last year. And not because I flew a crap ton of AS miles or anything. It was mostly thanks to that paid Emirates business class flight from Los Angeles to Dubai last May, and if you ask me, that was a very fun way of doing it. It sure beat the heck out of flying back and forth between San Diego and San Francisco million times! Alaskan Virgin Airlines A319 side view illustration by norebbo.com. Seat map of this Alaskan American Virgin Eskimo Air A319 (courtesy of seatguru.com) showing my seat (2A) for this flight to SAN. It’s been just under a year since Alaska Airlines officially swallowed Virgin America, forming the fifth-largest US airline. I don’t know about you, but I’m having a hard time letting go. Why do all the fun airlines have to die? It’s not fair! 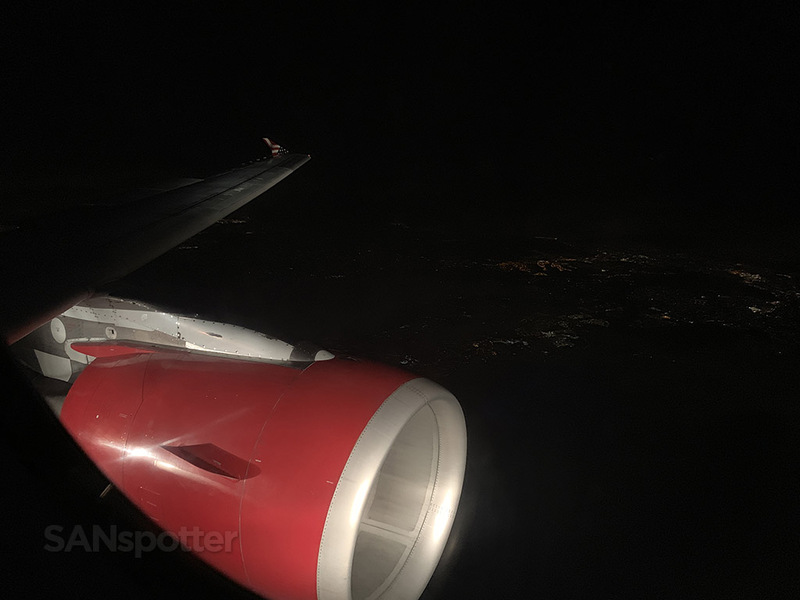 Anyway, as long as I still see Virgin America airplanes flying around, it’s an airline that still exists and I’m not willing to bury the coffin yet. 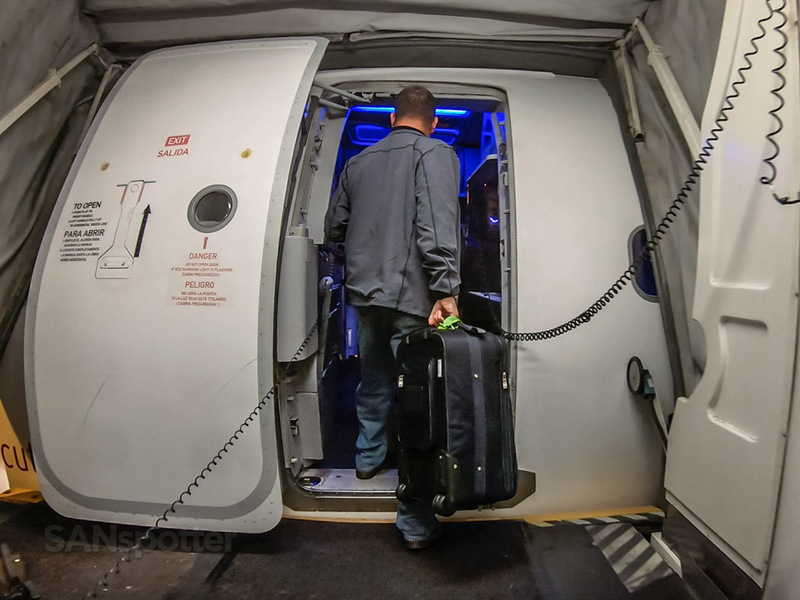 It might not be exactly like the Virgin America we used to know and love, but I’m still trying to fly those red white and blue Airbus’s (Airbii?) as much as I can before they slather Chester the Eskimo on the last remaining tail. 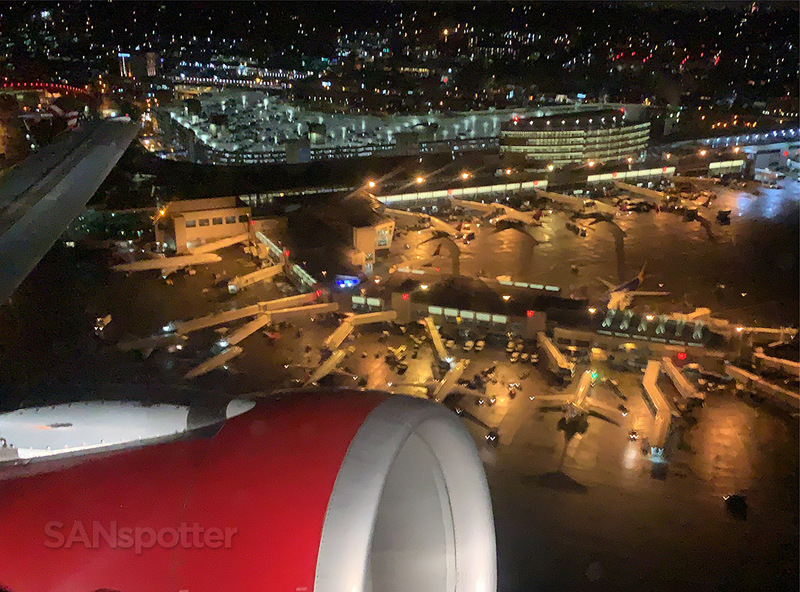 This flight down to San Diego tonight was chosen specifically for the fact that it was a Virgin America bird, and getting the first class upgrade thanks to my MVP status was just the icing on the cake. Hell yeah! This is the part of the review where I suspect that many of you are going to roll your eyes at me and become even more convinced than you already are that I can be a total weirdo sometimes. Thanks to my complementary upgrade, I had full access to any Alaska Airlines Lounge here at SeaTac tonight. However, I chose to forgo that little perk completely. 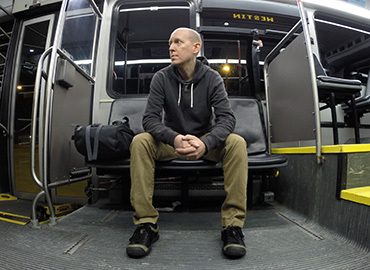 Why sit in a stuffy lounge when it’s more fun to ride the inter-terminal train? I neither comfirm nor deny that I did this twice. Just for fun. In my defense, it had been an extremely long day so far having flown two segments over 2400 miles starting in Montreal at 1 AM Pacific time. The only thing I wanted to do was walk around and stretch my legs, fearing that if I sat down somewhere comfy I would probably zone out and become miserable for the rest of the journey home. I needed to stay awake if there was any hope of continuing with getting footage for my trip reports and videos. Practicing my best Tarzan impression? Nope. Just a little tired that’s all. Keep in mind that these trip reports and videos are my job now. It’s what I do for a living, so when I’m traveling, I’m working. Therefore, I need to keep my legs busy and my mind sharp as I walked around the airport snapping pics and trying to find epic B roll. During the two hours I spent walking around doing my thing, I took notice of how large and diverse this airport is. Every terminal looks different to me, and there’s no cohesive layout and design from one section to another. 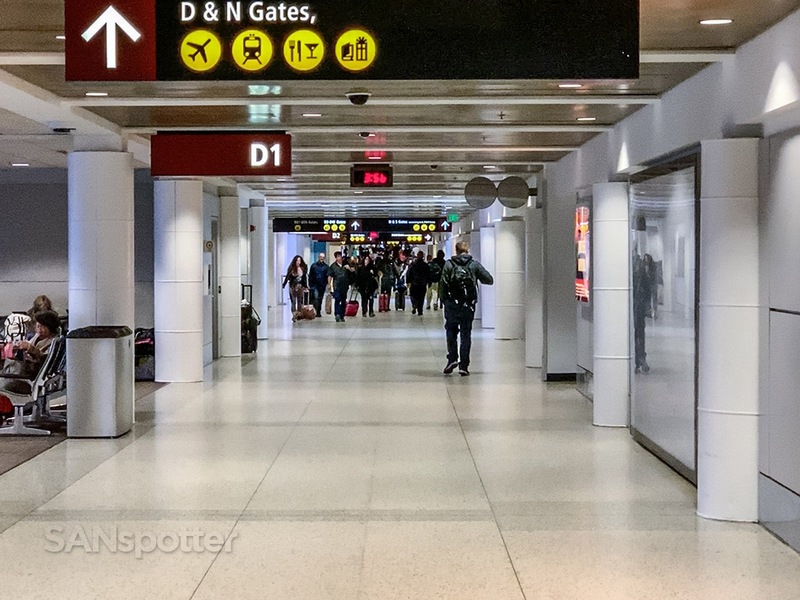 Not that I think that’s bad or anything, but it makes it hard to get to know the airport and to be able to find my way around with my eyes closed. Not that I’ve ever walked around an airport covering my eyes or anything. But it’s nice to know I could do it if I wanted to. 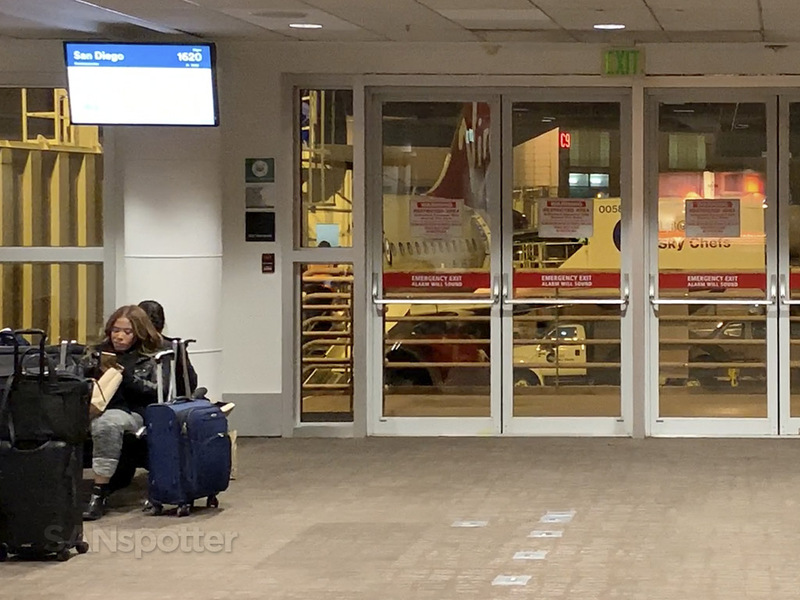 If you’re curious, the Alaska Airlines first class ground experience here in Seattle is unremarkable outside of the lounges. 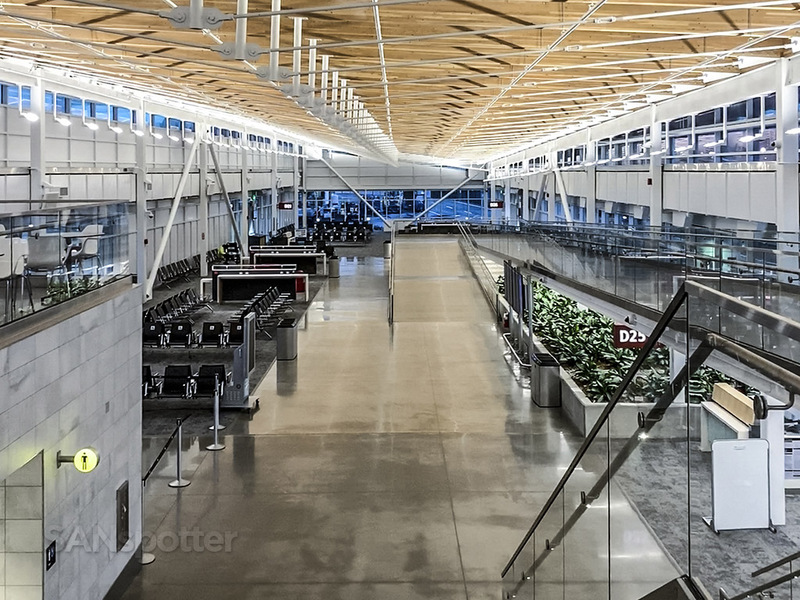 If you’re flying first class out of this airport on Alaska Airlines, you need to take full advantage of the complimentary lounge access. Don’t be dull like SANspotter. In the interest of full disclosure, this was the second time that I’ve experienced “Alaska Airlines” on a Virgin America aircraft. The other time was at the end of my trip to Iceland back in October, but my back was killing me by the time I got to SFO and I was in no mood for taking pics. Anyway, that particular flight was in economy class. This time it was going to be up front in first with those notoriously white (and obnoxious) leather recliners. It feels weird to be sitting in one of those things knowing that it’s Alaska Airlines first class and not my beloved Virgin America first class. It’s just so completely wrong. Virgin Alaskan flight number 1620 ready for boarding! …BAM! 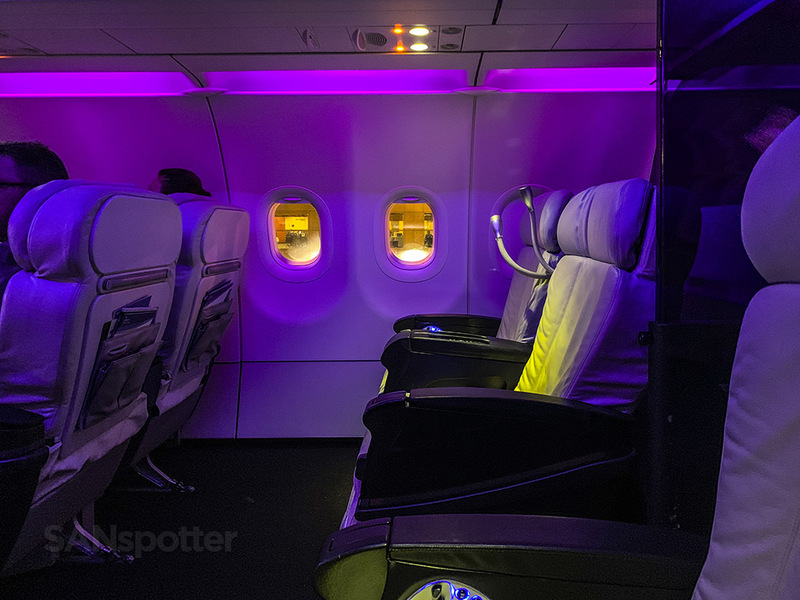 You’re gonna get hit square in the gut with that signature blue and purple Virgin America mood lighting (and it’ll feel good). I’m not a mind reader or anything, but I’ll bet anything she’s thinking “daaaaaaamn this is legit”. On the surface, everything looks exactly how I remember it back in the VX days. Huge white leather chairs with gobs of legroom between them, black accents everywhere, all draped in deliciously beautiful pink and blue mood lighting. I mean, really. 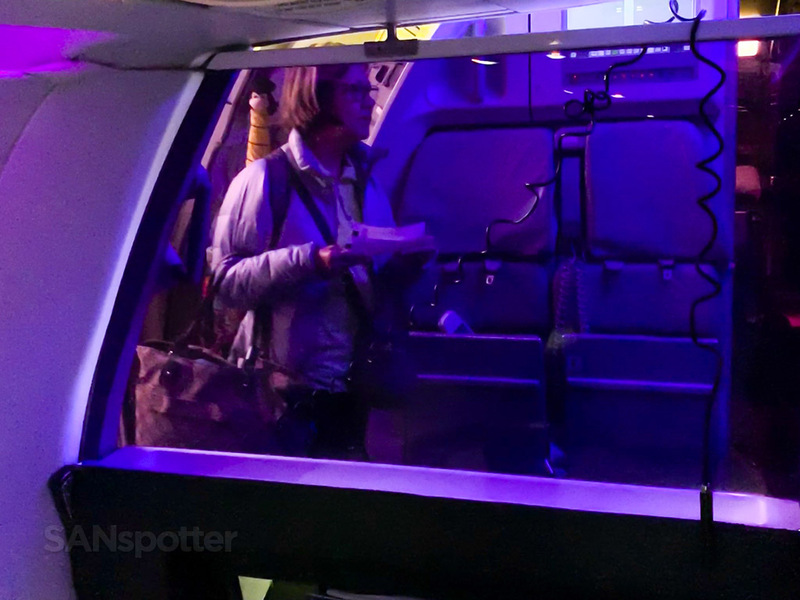 Is there no better caption for a pic of the Virgin America first class cabin other than “daaaaaaamn this is legit”? RIP Virgin America. I wonder if there will ever be another airline brave enough to do white leather in first class? Yes, these are mid-2000’s era seats, but they’ve got more functionality than many high-end business class seats I’ve experienced lately. The massage function is really good btw – so good in fact that there were several moments during this flight that I almost felt violated. The first indication that it’s not Virgin America first class is when they do the safety demonstration. 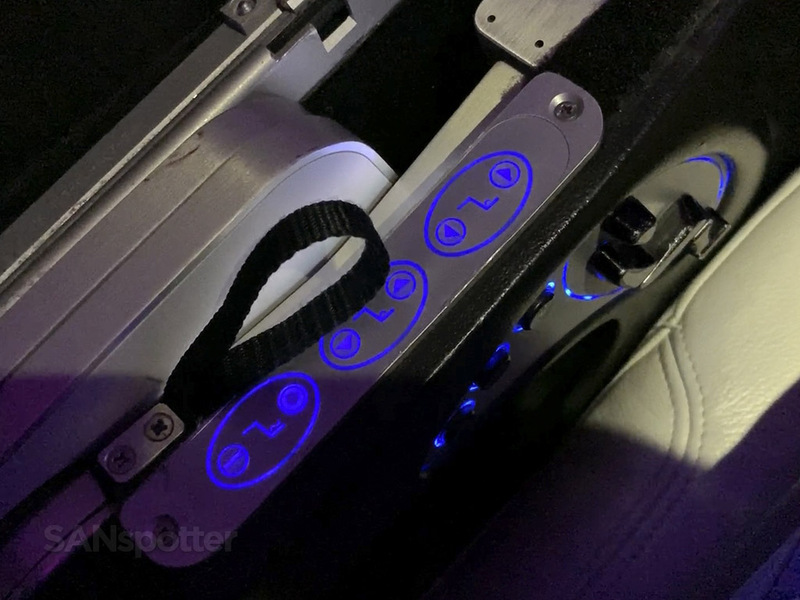 Instead of a live high-energy dance routine performed by young and hip flight attendants, it’s just a run of the mill (and very dry) explanation of how to use a seatbelt. I ask again: why did Virgin America have to die? It felt nothing short of sinful to be holding an Alaska Airlines safety card on a Virgin America airplane. How I managed to avoid getting struck by lightning upon arrival in San Diego is beyond me. 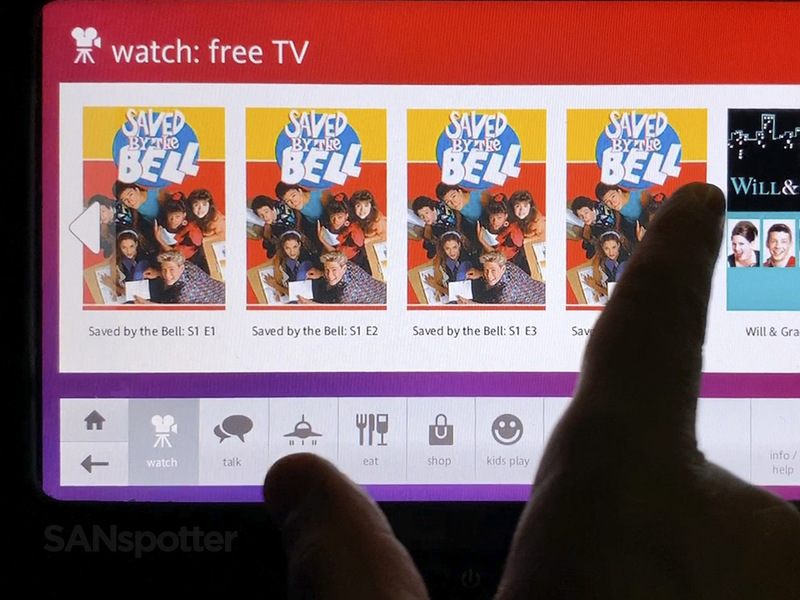 The next thing that you’ll notice is that the in-flight entertainment system is a convoluted mess of a mix between the old Virgin America Red product and the current Alaska airlines offering. A quick check of the in flight entertainment system (which folds out from the center arm rests) reveals that someone at Alaska Airlines is a huge Saved by the Bell nerd. I think I saw one episode of that in 1993 and I wasn’t about to pick up where I left off now. I’m a really big fan of both of these products, but not when they merge them together in a way that feels more like a temporary hack than anything else. For example, firing up the system for the first time will greet you with that glorious Virgin America Red splash screen, and you’ll feel the adrenaline running through your veins as you realize that they haven’t yet switched over completely and that VX isn’t dead quite yet. However, a few gentle taps of the screen will reveal that it’s just Alaska Airlines underneath slowly taking over. Speaking of in-flight entertainment, soak up views like this while you can because these will be Eskimo planes in less than a year. 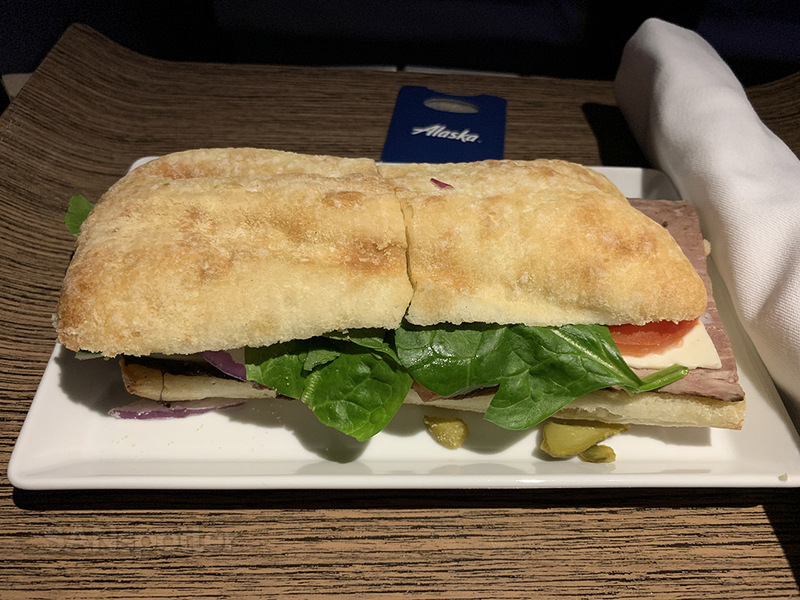 What’s the food like in Alaska Airlines first class these days? This is a question I was dying to know myself, since they recently switched up their menus to feature higher quality food than they were serving in years past. For the sake of comparison, when I flew Alaska airlines first class from Portland to Anchorage a few years ago we were served a humble plate of pasta and chicken that loooked like it came fresh out of a maximum security prison cafeteria. 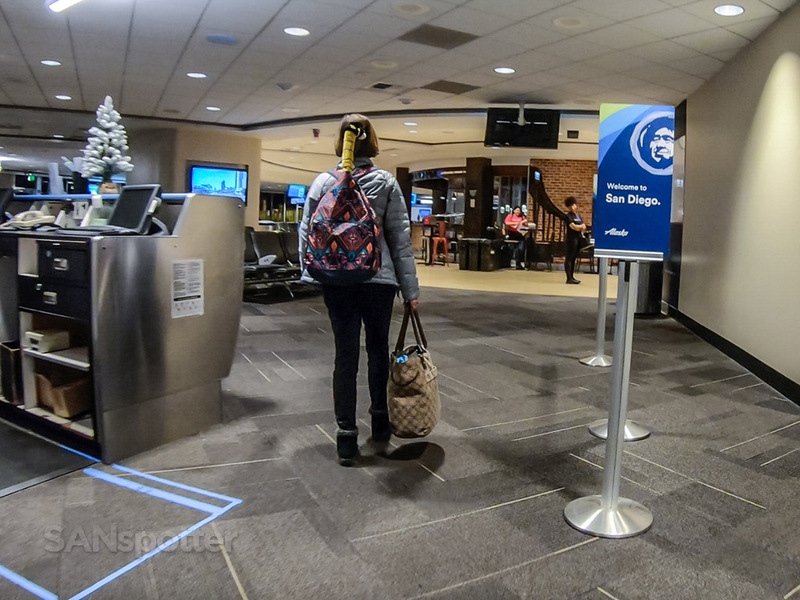 Compare that with my recent first class flight from San Diego to Orlando in March of last year (which was just after they switched over to the new menus) and the food quality was noticeably better. I was expecting really good things on tonight‘s flight down to SAN, but unfortunately, I think I set my expectations a touch too high. The only thing on the menu for this flight was a roast beef sandwich (slathered in mayonnaise) accompanied by a bag of potato chips. Disappointing to say the least, especially since my natural reaction when looking at mayonnaise is to gag. I hate the stuff. It may look like an innocent roast beef sandwich, but the first bite revealed the snarlingly hellish demon that it was. Mayonnaise should be illegal as far as I’m concerned. Despite wrinkling my nose with every bite, I ate every last crumb of that thing considering that this was my dinner tonight and it had to keep me alive until the next morning. It would’ve been a really good sandwich if it wasn’t for that mayo. Airline mergers have always been an awkward and frustrating process for all involved. It’s gotta be totally migraine-inducing for airline executives and staff trying to deal with two completely different business cultures (while attempting to stay up beat and energetic). Just ask United – it’s been 6 years since their merger with Continental has been official, and they still haven’t completely merged both systems. It’s a total mess from what I hear. 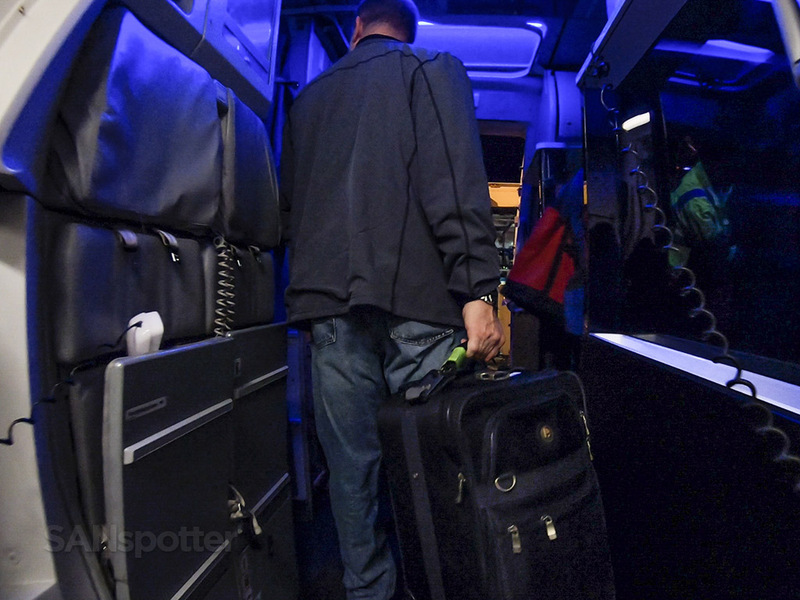 It’s rough even for us airline enthusiasts as well. Just sitting there in the remnants of the old Virgin America first class product made me feel nostalgic for yet another great airline that had been wiped from existence forever. It’s sad to see such a great airline die, especially sine there are so few new ones being born to take their place. On the approach into San Diego now, wondering if this will be my last ever Virgin America flight. 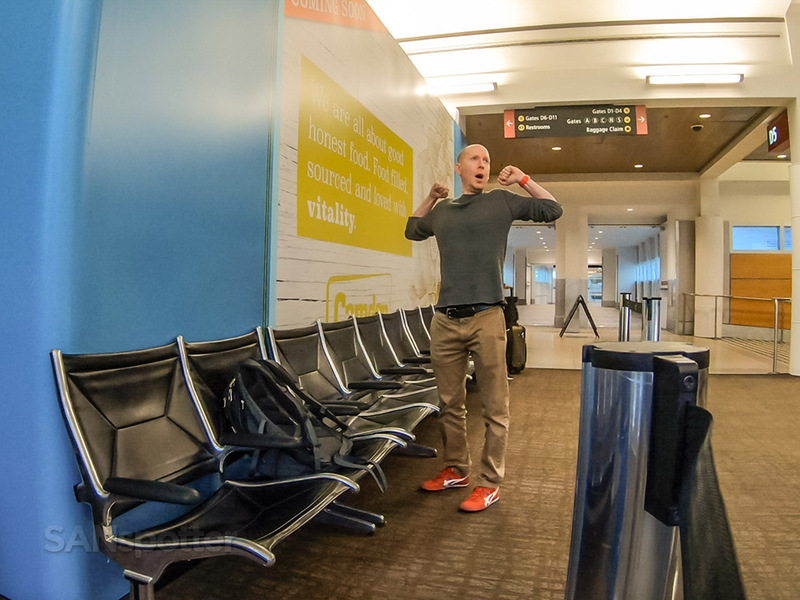 That’s right – I said Virgin America! Whether or not that was my last “Virgin America” flight remains to be seen. But what I do know is that this is the last time I’ll be arriving into T1 here at SAN on Alaska Airlines. 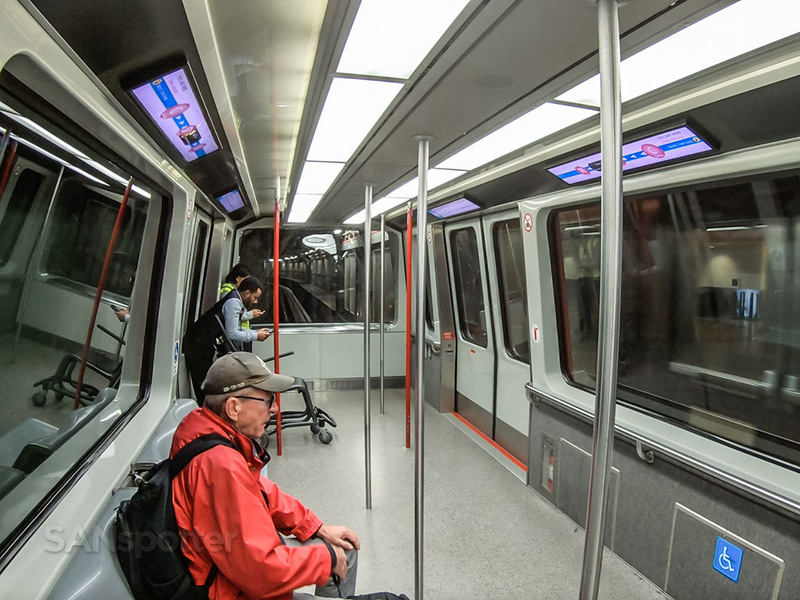 They are scheduled to move to T2 east at the end of this month and I’m happy as heck about it. No more “so-frustrating-it’ll-make-you-cry” Circle of Death experiences! 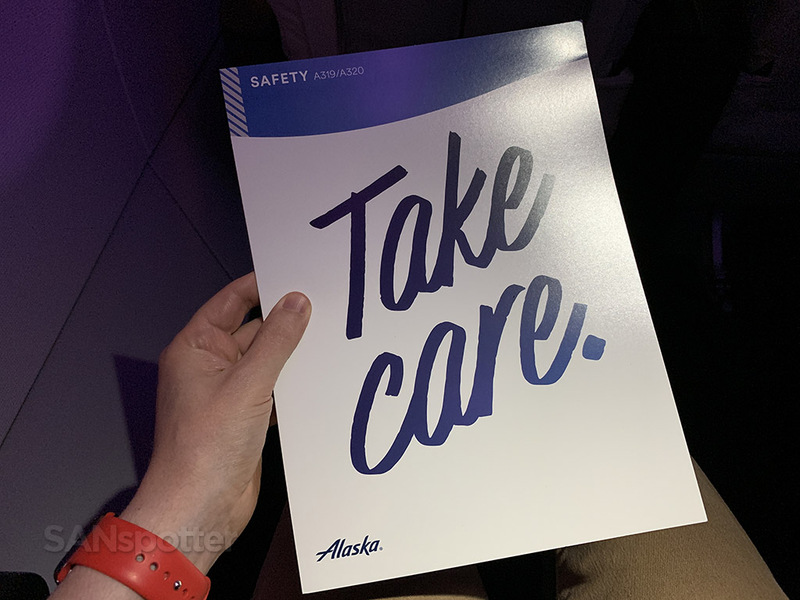 As much as I hate to see Virgin America go, I’m very much looking forward to the time when the all new Alaska Airlines first class product is fully integrated and we won’t be subject to these painful reminders anymore. 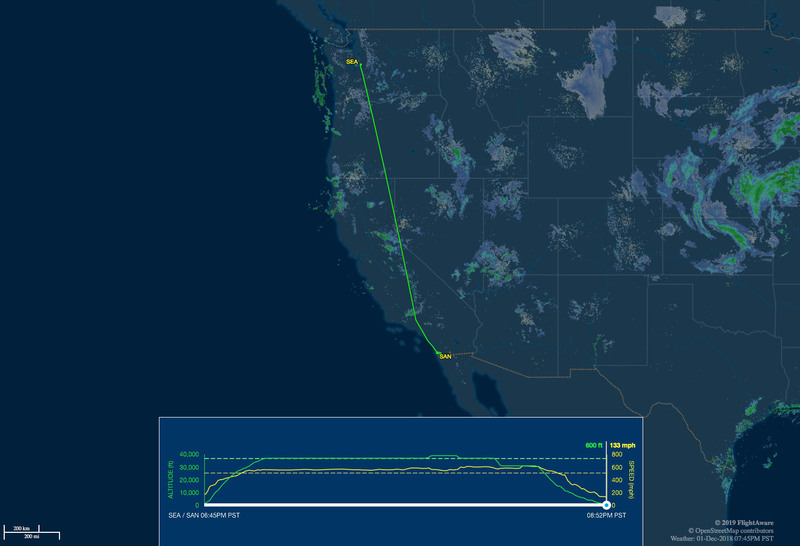 We’ve still got a ways to go before reaching that point, but I remain hopeful that Alaska Airlines can learn a thing or two about VX culture and elevate their game to the next level (pun totally intended). ¨Mayonnaise should be illegal¨ I agree! 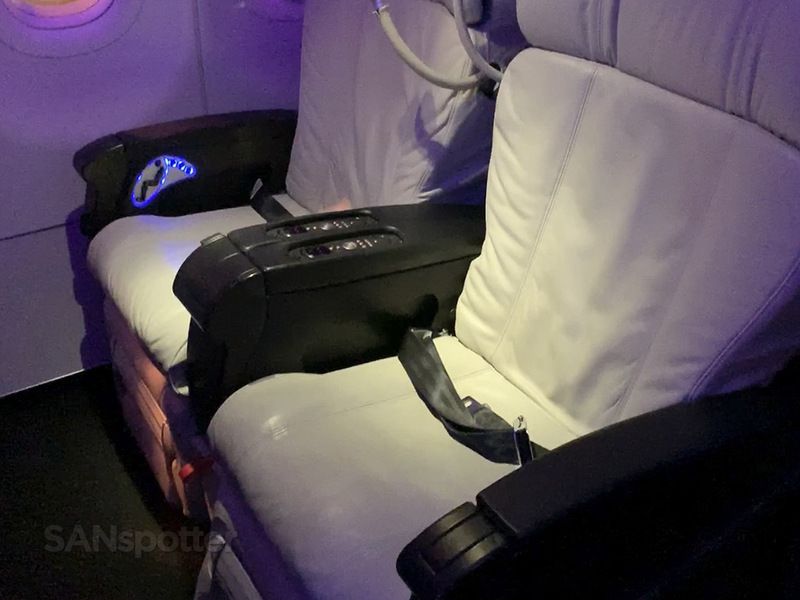 There may be some hope… Alaska is supposedly considering KEEPING the Virgin America first class seats!!! Reapolstered in Alaska Blue yes… But the same killer seats… This time spread out over the whole fleet!!! Anyway, wow – if that rumor is true it would certainly be a nice surprise. They are really good seats with tons of leg room so I’m crossing my fingers that it’ll happen. Also, upgraded tickets do not have complimentary access to the Alaska Lounges, FYI. Hey, Mr. Scott , it’s me again, good review!! It’s kinda cool to see a Virgin America still fly in the sky , also, have you ever flown to Richmond Int’l Airport? That’s my hometown airport. Nice to hear from you again! 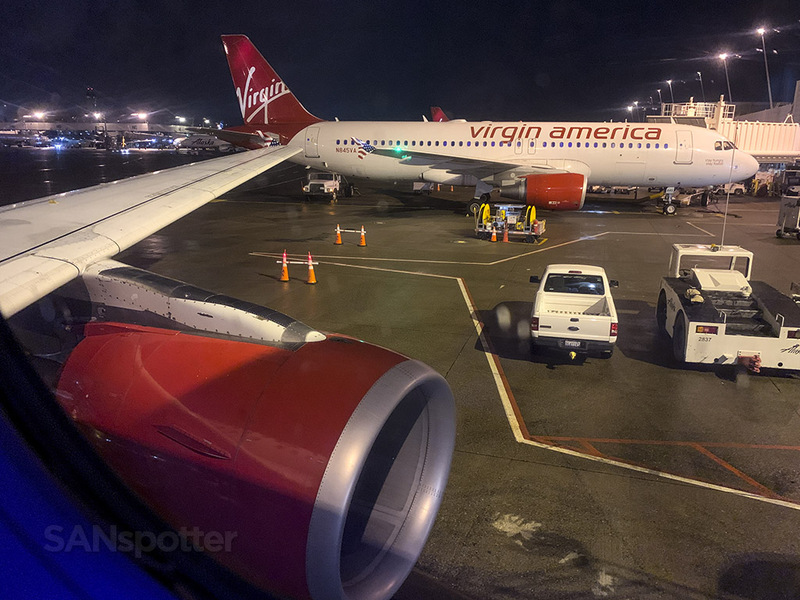 Glad you enjoyed this “one last time” Virgin America review – it’s always tons of fun to write about this airline even though I’ve done it several times in the past. I’m gonna miss ‘em! Anyway, nope, I’ve never been to Richmond. I hear it’s nice though so I’m sure I will at some point. I hope Alaska Airlines keeps the Virgin America Livery. And plus why are all the major airlines take out the airlines with the good callsign. Alaska is definitely not a low cost carrier. It may seem that way with their somewhat limited (and varied) route structure, but they are a full service airline just as AA, DL, and UA are. I do hope they keep at least one plane in the VX livery as well! 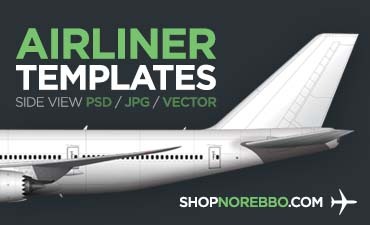 It’d be especially funny if they did it to a 737. Haha! Now that’s something I want to see. A Virgin American Boeing 737. Now I’m tempted to create a rendering of that. I bet it would look great!